As a kid at camp in Maine, I loved to sign up for the hiking trips. Typically, we hiked portions of the Appalachian Trial, usually carrying supplies in a frame pack on our back, camping out for a few nights at a time. We always brought “Gorp”, an easy-to-pack, energy-filled trail mix which was adored by all. Camp gorp consisted of chunks of homemade granola, raisins, peanuts, and M&Ms. (Every once in a while, the M&Ms were replaced with carob chips which was not popular!) So tasty were the granola chunks and M&Ms, I saved them for last. In the past, I have made many versions of Gorp. My chunky granola recipe was inspired by the memory of what I enjoyed eating at camp. The snack mix I make using that granola as a base is one of my all-time favorites. This “gorp” contains yummy chunks, too, this time using a mix of cereals held together with some white chocolate “glue”. What could be better? For a festive treat, use holiday-colored M&Ms. For a healthier version, substitute the M&Ms with dried cranberries. This recipe, which was adapted from a recipe originally given to me from allrecipes.com, makes a large quantity which will store well in an air-tight container. In very large bowl or roasting pan, combine the cereals, pretzels, cashews, and M&Ms. Melt the white chocolate in the microwave in thirty second increments, stirring as you go. (I use a quart-size Pyrex measuring cup for this.) Once it is completely smooth, pour over the cereal mixture. 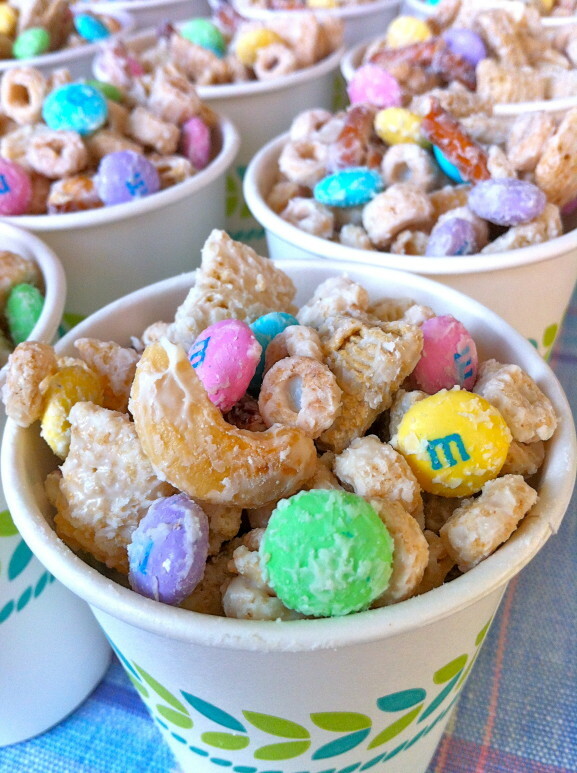 Gently toss until all of the cereal mixture is evenly coated. Carefully, turn mixture onto a large piece of parchment or wax paper to cool. Once cooled, store in an air-tight container. This recipe was shared with Moonlight & Mason Jars. This looks so yummmy, and cute with the holiday M&Ms. Oh I must make this for the grands! I hope they love it, Grammie Barb! This looks awesome. My boys love all of these ingredients, so I know that if I toss them all together it will be a winner. Such a fun spring treat. Pinned! Thanks so much, Blair. My boys love this, too! Gorp!! Wow, I haven’t heard of or thought about that for years (like 40). We also made gorp at camp (New Hampshire). Yours looks like the perfect spring time combination. I have made this and everyone Loves it. Sometimes I throw in colored marshmallows for an Easter treat. I’m so glad it’s a hit, Judy. Your addition of marshmallows sounds perfect!